In 1872, in the French port city of Le Havre, 32-year-old Claude Monet made a painting that would give an art movement its name. Monet called his painting Impression, Sunrise. It was a quick, brushy harbor scene — small boats and watery reflections in pinks and blues and oranges. 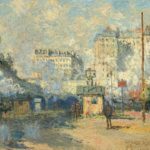 When Monet displayed the painting in Paris, along with similar works by artist friends, a sneering critic called the show “The Exhibition of the Impressionists” — and a movement was baptized. Visitors to the Andre Malraux Museum on the Le Havre waterfront can see what the great impressionists saw — the English Channel, full of glints and glimmers as light catches its currents. […] The impressionists broke all the formal academic rules — they used quick brush strokes, changed perspective, made their shadows out of color, not black. And it all started with a young painter, sitting by the water’s edge in Le Havre.